"My sister made the original version of this recipe, but I tweaked it to make it my own. It is very easy to prepare and makes a delicious and pretty addition to any party. Perfect for the summer!" 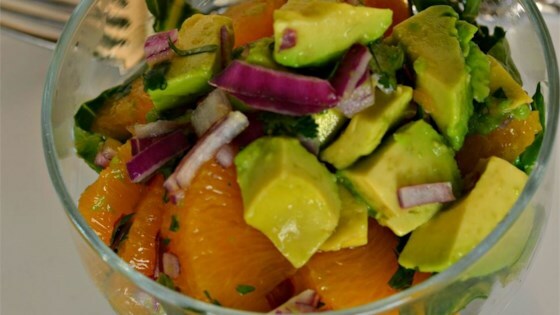 Mix avocados, red onion, mandarin oranges, cilantro, and lime juice together in a bowl. Stir enough reserved mandarin orange juice to coat the avocado mixture. Very nice combination of flavors but I think I would prefer fresh mandarins or oranges and just use the natural juice of the mandarins to coat the avocado mixture.